The most distinguishing characteristic of rubber is kinetic elasticity. Kinetic elasticity is time and temperature dependent and is affected by crystallization factors. Although other properties and factors correlate to kinetic elasticity, ultimately the largest factor impacting this property is low temperature. The elasticity of rubber gradually diminishes at lower temperatures, until it disappears altogether. The temperature at which total elasticity loss occurs depends mainly on the chemistry of the rubber and its compounding. In some rubbers, the changes in elastic behavior, caused by a decrease in molecular motion as temperatures fall, are complicated by crystallization. The extent and rate of the formation of crystallite structures depend not only on the temperature and the length of exposure, but also on the extent of deformation imposed on the rubber. Since low temperature can lead to cracking, breaking, and failure of a rubber seal, testing low temperature elasticity is imperative to ensuring seal performance. One of the most recognized low temperature tests is “Retraction at Lower Temperatures (TR Test)”, [ASTM D1329]. This test method provides the temperature retraction procedure for rapid evaluation of crystallization effects and for comparing viscoelastic properties of rubber and rubber-like materials at low temperatures. TR testing is useful in determining a material’s suitability for low temperature service.1 For rubber compression seals, TR-10 values provide an excellent means of approximating the low temperature capability of a given elastomer. The rubber industry often defines a material’s low temperature rating by taking the TR-10 measurement in Fahrenheit, and subtracting 10 degrees. 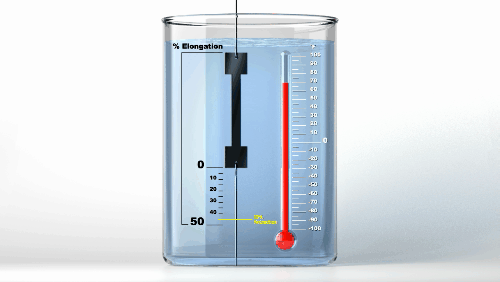 Application experience has shown that an elastomer will maintain a static seal at 10oF below the TR-10 temperature. In dynamic applications, seals perform well at the TR-10 temperature rating. TR-10 is the temperature at which the compound regains resiliency and transitions from soft plastic behavior to rubber behavior. In this method, the compound is clamped, then stretched 50% in a temperature controlled chamber, and cooled to a temperature below the freezing point of the material. At this time one end of the specimen is unclamped and the specimen stays elongated. Gradually the chamber temperature is increased until the material regains flexibility and begins to retract. The temperature at which the specimen retracts 10% of its elongated length is defined as TR-10 temperature. The setup for the TR-10 test is show in Figure 1 below. For most compounds, a length of 1.50” to 2.0” is suitable. The thickness of the specimen shall be 2.0 +/- 0.2mm [0.08 +/-0.01”]. For accuracy, a minimum of three specimens per each material/compound should be tested. 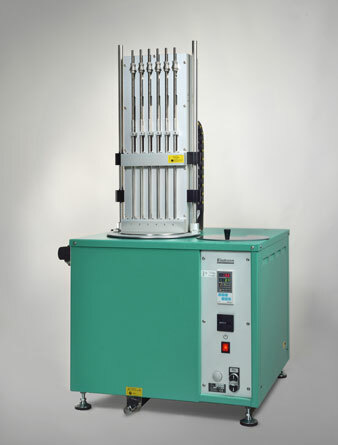 Figure 3- Picture of TR-10 Testing Equipment. Many different chemical formulations exist in commercial elastomers in order to meet certain application requirements such as, fluid resistance, pressure resistance, abrasion resistance, as well as high and/or low temperature resistance. 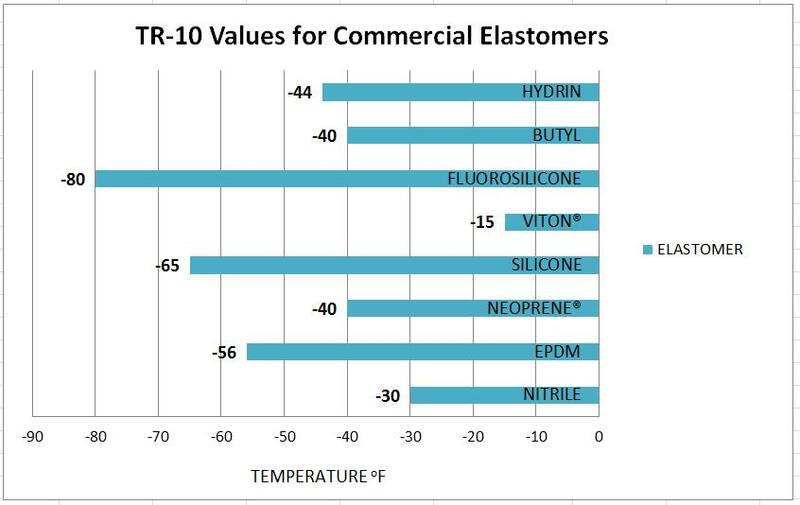 Figure 4 provides some general TR-10 values for commercial elastomers. Once the chemical family has been selected to meet the service requirement of the application, TR-10 testing of multiple compounds within that family can be used to ensure the material selected has suitable low temperature elasticity. The Gund Company supplies high performance elastomeric materials to meet the needs of your demanding applications. We have elastomeric test capabilities that allow us to characterize the specific properties of the products we supply. Our Engineering team can assist you with your material selection for a specific application. If you have specific questions about low temperature elastomeric applications or the TR-10 test method, please contact by clicking here.